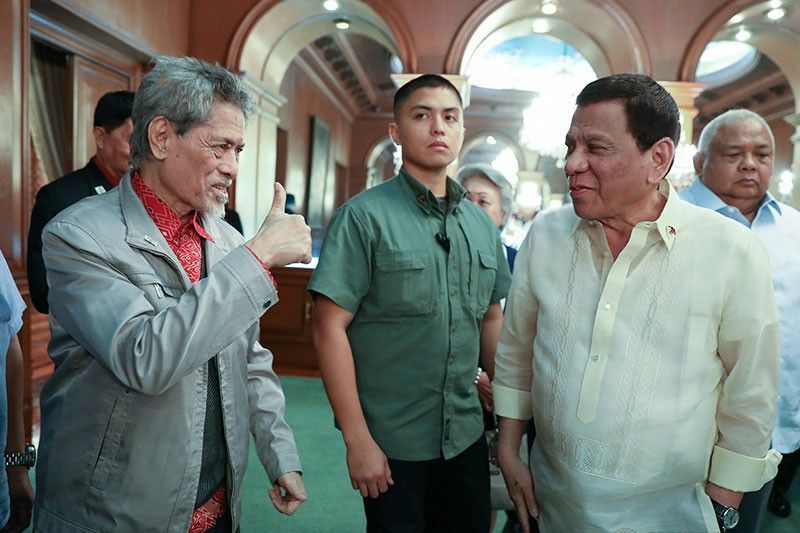 President Rodrigo Duterte looks on as Moro National Liberation Front Founding Chairman Nur Misuari gives him a thumbs up gesture during their meeting at the Malacañan Palace on Feb. 25, 2019. MANILA, Philippines — Moro National Liberation Front founding chairman Nur Misuari has threatened to go to war if the proposed shift to a federal system does not push through, according to President Rodrigo Duterte. The president said he met with the Misuari, leader of one faction of the MNLF and who has returned to the country after a trip to the United Arab Emirates and Morocco. "Sabi ni Misuari kagabi, 'If you do not give it to me, let me be very honest: I will go to war,'" Duterte said Wednesday night in a speech at a PDP-Laban campaign rally in Marikina City. Duterte said he told Misuari that he understands him and suggested forming a panel for transparency as the government cannot negotiate in secret. "Sabi ko, para day-to-day they will be briefed kung ano ang outcome — how gusto mong maapply ‘yang federal system sa gusto mo. Kagaya ba ng — ‘yung (Bangsamoro Organic Law) o a different type," the president said. The president claimed it was President Corazon Aquino who initially promised a federal form of government for the Moros. "Sabi ko, 'Kung wala nang iba, ‘yung federalism huwag nating kalimutan passed by Congress.' Sabi ni Misuari and I am making it public and you can ask the persons who were there. Sabi niya, Rod, magkaibigan, brod. Pero you know, you have to have something like this," Duterte said. The Duterte administration has been pushing for a shift to federalism, a campaign promise that the president said in his 2018 State of the Nation Address he is confident Filipinos will support. A Pulse Asia poll conducted in June 2017 suggested that 67 percent of Filipinos are not in favor of amending the 1987 Constitution while 62 percent are against the proposed shift to a federal system of government. Misuari has returned from attending the Organization of Islamic Cooperation's 48th session of the Council of Foreign Ministers in Abu Dhabi and the 14th session of the Parliamentary Union of the OIC in Rabat earlier this month. Anti-graft court Sandiganbayan had allowed the MNLF founding chairman, who is facing graft and rebellion charges, to leave the country. Presidential peace adviser Carlito Galvez Jr. and Interior Secretary Eduardo Año were also present during Duterte's meeting with Misuari Tuesday night. During Duterte and Misuari's previous meeting in February, the president apologized to the Moro leader for the delay in enforcing agreements on federalism. "The president told the chairman that he admired his patience and he apologized for not having implemented whatever agreements that they had previously with respect to federalism," presidential spokesperson Salvador Panelo said. When Duterte took office in 2016, he promised to honor all peace agreements with the MNLF, as well as the Moro Islamic Liberation Front.